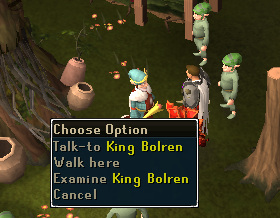 Talk to King Bolren in the Tree Gnome Village. 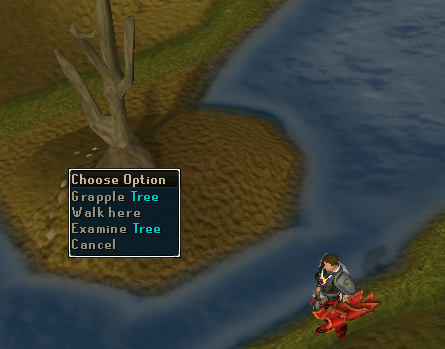 Head to King Bolren in the Tree Gnome Village, and talk to him. He will explain that he's got a new pet that he thinks is innocent and furry and cuddly, although, as always, you know better! You'll need to find somebody who knows of an anti-illusion device to stop this poor King being spied on by an evil being. Leave the Village by Squeezing through the railings in the south-west corner, then climb down a ladder a short distance to the east. Once down the ladder, head west and talk to Golrie. He will explain that what you are looking for can be found in the Strongroom in the other part of the cave, and to enter this room you will need a key. Head to the eastern part of the cave, and crawl into the tunnel on the northern wall. Once through, you will be faced with a sliding puzzle to complete by pushing some monoliths around. While moving the monoliths, search all the crates and chests that you pass. Push the first one north, head past it, and you will be faced by several more monoliths that will require a small amount of skill to get around. 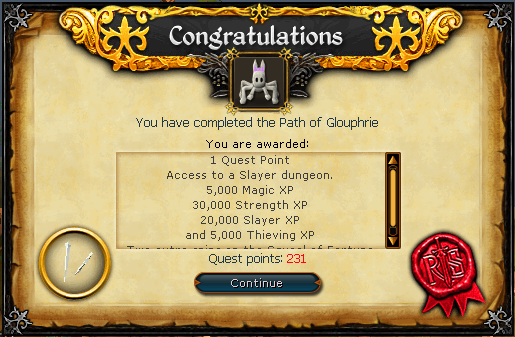 Along the way you should have searched the chests and crates to have A Key to a Chest and Yewknock's Notes on Crystals in your inventory along with a number of shapes like were required to complete the puzzle in Eyes of Glouphrie. 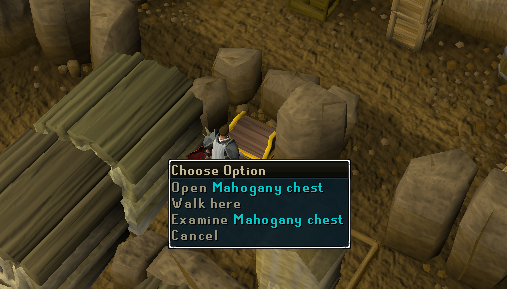 If you do have the Key, you can open and search the Mahogany Chest to find the Strongroom Key. Use the Strongroom Key to open the door to the west of this Sliding Puzzle Room. Once inside, you will need to need to add one shape that equals the sum of the two shapes at the top and then add two shapes that add up to the value of the single shape. Once you have solved the puzzle, there will be a cut-scene and the cute, fluffy creature will show its evil side! Head back to King Bolren who will ask you to kill the evil creature. It only has 1 Life Points, so attack it, and it will die effortlessly. Talk to King Bolren again and he will talk about the city of Arposandra that Longramble was trying to find, and that you should talk to Aluft Gianne Jnr to find out more about the location of this wandering Gnome. 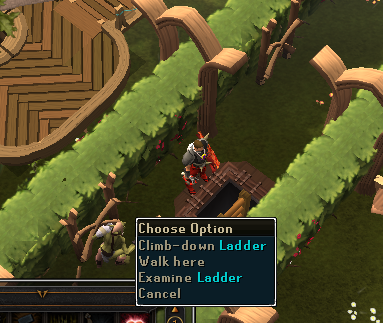 To find him, head to the Grand Tree, climb up one ladder, and he can be found to the west sitting in a chair. Due to the importance of this, he will give you the co-ordinates of Longramble, and that he has ordered some Tangled Toads Legs. Bringing this dish to Longramble is not necessary to finish the quest, but if you'd like to receive a small reward, you can cook the dish and bring it to him. 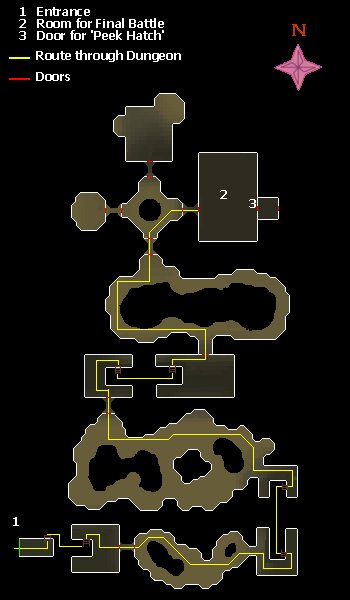 The co-ordinates that you were given will lead you to somewhere to the west of Castle Wars, and east of the Poison Waste, and to get there you will need a Mithril Grapple along with a Mithril or better Crossbow to fire it. A Grapple can be made from a Grapple Tip, Mithril Bolt and some Rope, while the Crossbow is made from some Limbs, a Crossbow String and a Stock. Once you have the Grapple and Crossbow, head round past the southern walls of Castle Wars, keeping to the northern coast when you get to water. Eventually you will come to a Tree that you can use your Grapple with. 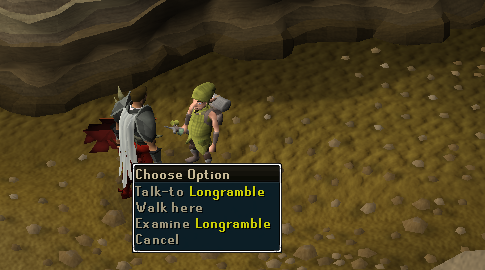 Swing across the gap and you will find Longramble there who you should talk to. He will explain about his adventures and how he was trying to be the first Gnome to see the edge of the earth since it's clearly flat, however is currently taking a detour from this trip to find the city of Arposandra. Once you have finished talking to him, head north and talk with the Spirit Tree that doesn't look very well. 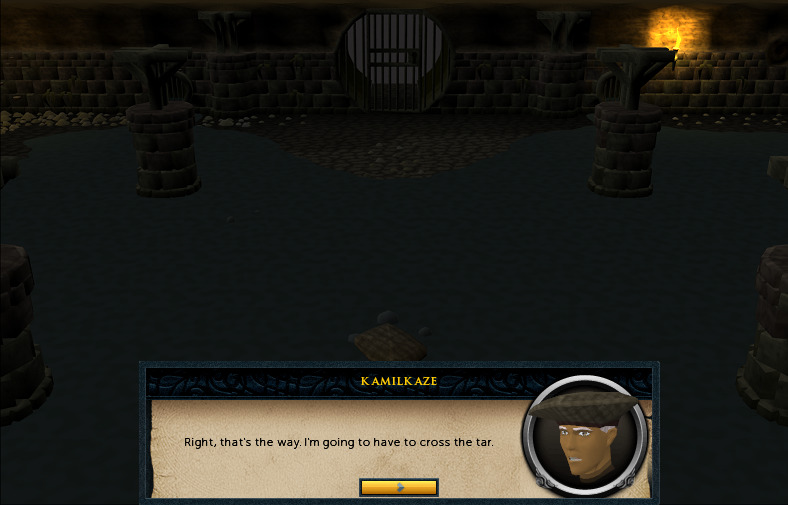 You will communicate with each other via the anima mundi, and part way through Hazelmere will come into the conversation, complaining that you disturbed him from a very important thought. You will discover that there are evil things happening that are the reason for the Spirit Tree not being at full health, and that a Plant Cure or similar will not help. What will help, however, is something to do with the chanting of Seren, and the mysteries of the Elves. To do this you will need to get hold of a Crystal Seed like the one used to make the Crystal Saw from Eyes of Glouphrie. If you haven't kept your Saw, you can get it back from Brimstail, otherwise, the Saw, or Seed it is formed from, is what you will need. With this Seed or Saw, head back to the Sliding Puzzle Room from earlier in the Quest, and work your way to the Singing Bowl that can be found in the north-east corner of the room. If you have brought the Saw, you will need to 'Revert-crystal Singing bowl' at this point. Once it is in the form of a Seed, choose to 'Sing-glass Singing bowl'. Upon each action, a cut-scene will play with you chanting over the Bowl, and the action logged in your chat box. Once the Seed has been enchanted, you will find yourself with some Crystal Chimes. 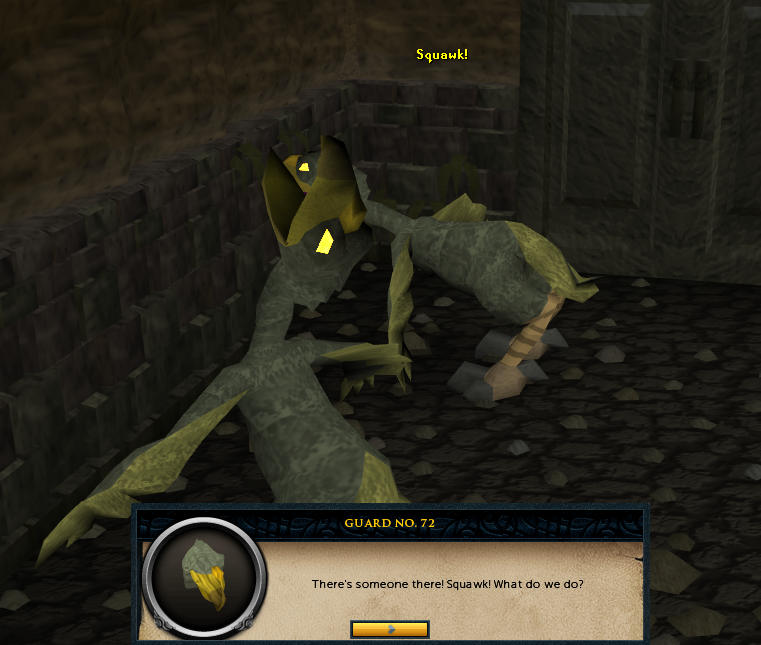 Take these back to the Spirit Tree near Longramble and use them on it. 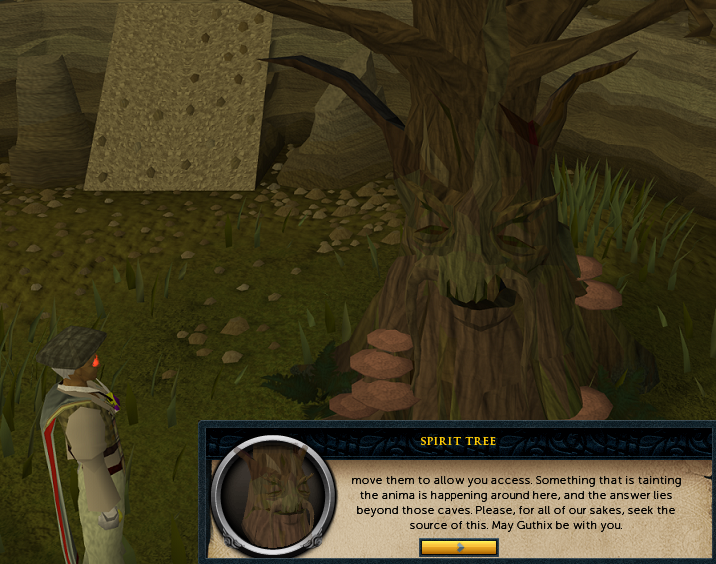 A cut-scene will play in which the Spirit Tree will become better again! 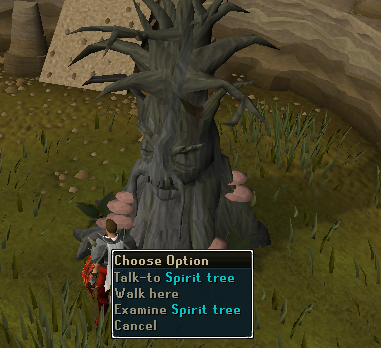 This Spirit Tree will now be accessible via the Spirit Tree network. This is the point that you will need to prepare for battle in a location that you cannot Teleport from. The main battle will be against three level 118 Warped Terrorbirds in a multi-combat zone, although to get there you will have to run past numerous level 100-120 monsters that are equally nasty, and you are likely to lose in the region of 4,000 Life Points running past them. You cannot Teleport in the room the main fight is in or in the long tunnel to get to it. 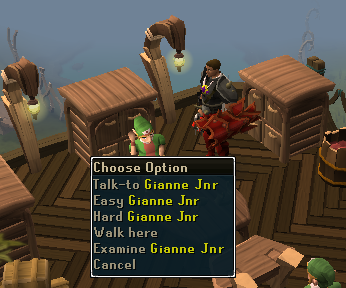 You can, however, Teleport from the room with Giant Tortoises outside the main fight room. The Dungeon with these horrors in can be found south-west of the Spirit Tree down a Sewer Pipe, and up a Ladder. Once you get to the battle, it isn't as difficult if you manage to use the scenery correctly. If you stand next to one of the pillars, you will be able to trap at least one of the Terrorbirds behind it, meaning at no point will you have more than two of them attacking you at once, and once you've killed the first won't need more than one attacking at a time. Turn on Protect from Range. Enter the room for the final battle run toward the furthest pillar on the left (NE) when you enter, choose the second row of pillars. Stand behind the pillar. All other creatures now will line up behind the other pillars in the room. You now should be able to kill the first one. If you run out when attacking him, and the other monsters again come into your line of sight, switch to the monster in the middle. Make sure you keep in one line with the pillars. That way the first one will be hidden from you. Kill the middle one, the next one can be either of the two remaining. Just make sure you keep in-line with the pillars. 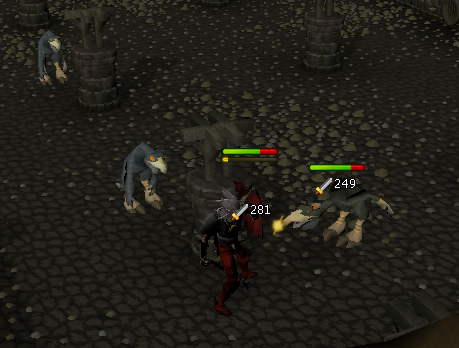 A level 120 combat won't use more than three sharks this way. When in the fight, none of the Protection Prayers will work fully due to multiple attack styles being used, although Protect from Range is the most helpful, since it is the most common attack style that is used. You will, however, still be hit with Melee attacks, so Food is certainly worth having with you. In your inventory you will need to make sure you have the Crystal Chimes with you otherwise it will be impossible to hit any damage at all. Due to the fact that the Terrorbirds have a long range attack, it's no good relying on Ranging or Maging them from behind a Pillar to stay safe since if you can attack them, they can attack you. Taking high level food is a must, and other things such as a Super Set and turning on Piety (or similar Prayers) will help you kill them easier. 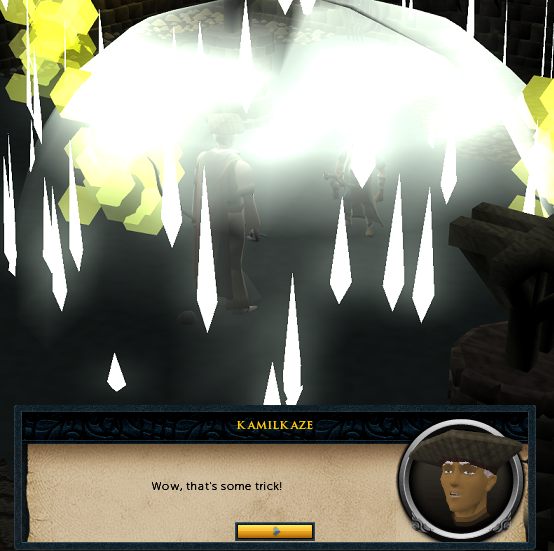 If you want to be able to hit any damage, you will need to use the Crystal Chimes on the Terrorbirds. This will change their color from blue to gray, and make it possible for whatever weapon you took to hit any damage. 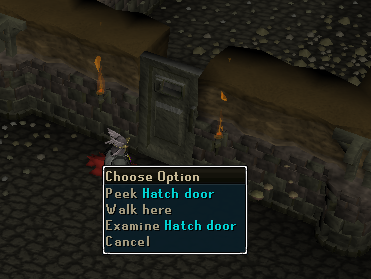 Once you have killed all 3 Warped Terrorbirds, head to the door on the opposite wall to the one you entered the room, and 'Peek Hatch door'. Upon looking through the hatch, you will find two Terrorbird Guards arguing, then realizing that there's somebody, you, there and pressing the Red Button! It may seem like a scene out of a bad movie where the bad guys realize that something bad is happening, so release their weapon, but it's probably because it is. This Red Button will be the bringer of your fate, with Tar being released out of the Pipes, flooding the floor to the exit. You try to run across the Tar, but unfortunately get stuck part way, so begin going crazy, but that's not all. 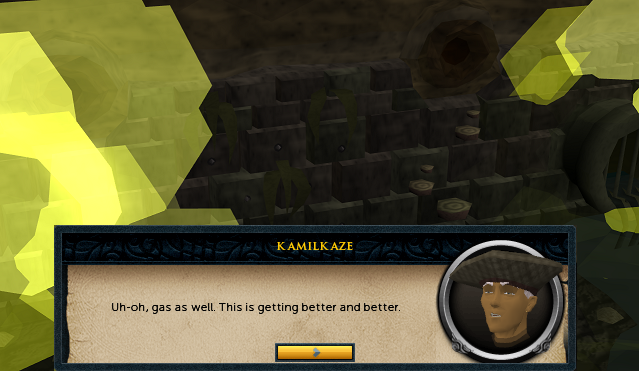 Now that the Tar has secured you in place so you cannot move, along comes the Gas ready to suffocate you as well! 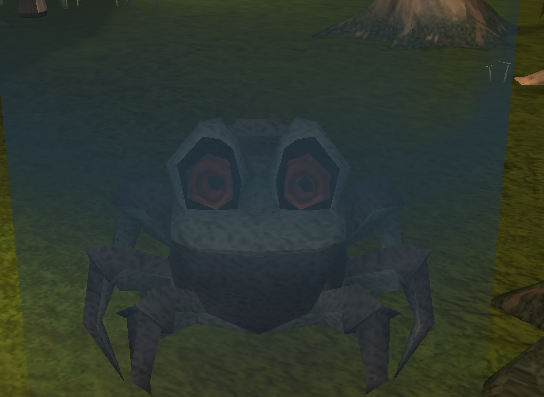 Projectiles then start firing at you, so you start becoming dizzy, falling unconscious in the process, thinking your dead, but manage to subconsciously link yourself into the anima mundi, and obtain the attention of Hazelmere who comes to your rescue. 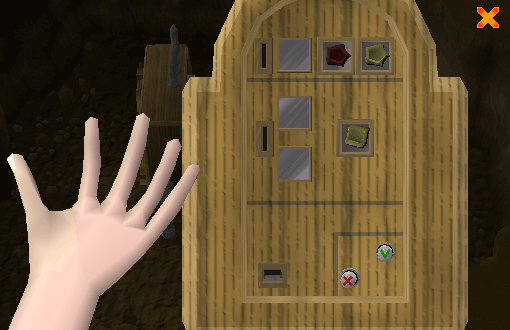 The room you're in has been enchanted to make Teleportation impossible, but good ol' Hazelmere has a Grand Seed Pod that will Teleport you out of the mess you've got yourself into, and unfortunately end the interesting cut-scene. You'll find yourself in the house on his peninsular, so talk to him and he will explain that his time is coming to an end, and he will soon have to pass the guardianship of the Spirit Trees onto someone else. Continue the conversation and the quest will be completed! After finishing this quest you will have access to the dungeon; all monsters within it need the Chimes you made from the Small Crystal Seed to conquer them. 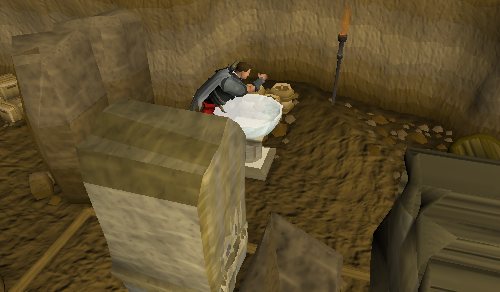 Should you need a saw for construction you will have to revert the Chimes to a seed and then use them with the Crystal Bowl in Brimstail's cave. This bowl now too has the option to "revert-Crystal" option. [^] Head to Longrable at the given coordinates and talk to him.